The CTEEA has Established a NEW Group that Replaces the CTELC Leadership Group of the Past. 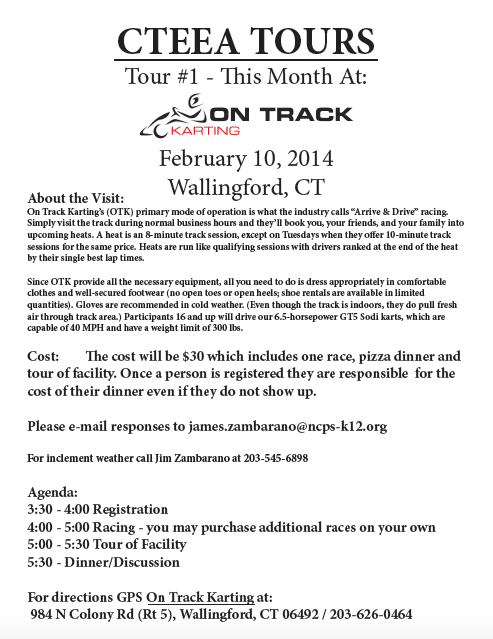 The CTEEA TOUR GROUP hosted their first after school gathering at the On Track Go Cart facility in Wallingford on February 10th. To Learn more more about future Tours select Tour Group Above and register TODAY. What is the CTEEA Tours Group? 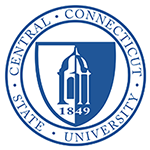 CTEEA Tours is a program where Connecticut Technology & Engineering Education Association (CTEEA) members can network between technology & engineering educators throughout Connecticut. CTEEA Tours will be open to any member of the CTEEA. An eligible participant may become a CTEEA member by paying an annual membership due. Non CTEEA members who are educational professionals dedicated to technology & engineering in Connecticut may also participate in the CTEEA tours for an additional fee, not including the tour and meal costs. Anyone who is registered and committed to the tour and does not attend, will still be responsible for the tour and dinner fees. - paying vendors for services rendered in the organization’s behalf. - facilitates the establishment of a yearly program schedule. Chairperson and Treasurer/Secretary candidates are currently volunteer positions. The Chairperson and Secretary/Treasurer may become an elected position as the organization becomes more established where candidate can then be elected by a popular vote for two year terms.